Jennifer Thermes grew up in Port Washington, New York, with her nose in a book and a pencil in hand, drawing endless pictures of horses, and trying to convince her parents that of course they could keep a pony in their suburban backyard. (Her parents did not agree.) After graduating from Parsons School of Design with a degree in Communication Design, Jennifer worked in a magazine art department for several years before becoming a full-time illustrator. Jennifer is the author and illustrator of When I Was Built, and Sam Bennett’s New Shoes, which was a Bank Street College Best Children’s Book. Her recent books as illustrator include the middle-grade novel Maggie & Oliver, and picture books The Iciest, Diciest, Scariest Sled Ride Ever, Helen Keller’s Best Friend Belle, and There Are No Moose on This Island! While busy with two new books forthcoming as illustrator in 2014, Jennifer is happily anticipating a sliver of time to get back to several story ideas of her own. Jennifer also creates illustrated maps for magazine and book publishing clients. A page of thumbnails for 32 page picture book, Bear and Bird. I spend a lot of time making teeny tiny thumbnails and working out the flow of the book as a whole. Shown here is an early stage for one of the Bear and Bird pieces. I’ve transferred the drawing to watercolor paper using my light-box, and taped it to a board. Lately I’ve been using 140lb. Fabriano Soft Press paper, but Arches Hot Press Extra White is a favorite as well. The tape is plain old painter’s tape. It holds the drawing in place in case the paper buckles a bit, but lifts off easily with no residue when I’m done. I don’t stretch my paper beforehand, as I don’t usually work very wet with the watercolors. Finished spots for Bear and Bird. This is endpaper art-in-progress for Bear and Bird. After I transfer the drawing to paper I refine it with pencil, and then start layering back and forth between line and the color. I work in pencil and watercolor, and like to build things up slowly in layers, which can take some time, but I’ve found that it doesn’t have the same effect if I rush things. For this reason I usually have three or four pieces in progress at the same time, so I can let them rest for a while in between. As far as materials, I use Winsor & Newtown watercolors, and my favorite black pencils are Prismacolor col-erase (because I DO erase sometimes! ), and Faber-Castell Polychromos, which has a wonderful rich, dark line. Thumbnails of various cover ideas. Final cover for Bear and Bird. I’ve been illustrating for about 20 years. How did you decide to attend Parsons School of Design? I grew up on suburban Long Island and was enamored with Manhattan when I was in high school. (It was the early 80’s, after all!) Since the city was just a short train ride away, I spent a lot of time there with friends. Parsons seemed like the right place to be. Can you tell us a little bit about Parsons? It was a good school and the classes were intense. A lot of the kids were commuters— as was I— so they were busy years, since I held down a job at the same time. (Waitressing, which was its own education in human nature!) Most of the professors worked in their respective fields, which made the classes feel relevant. Did the School help you get work? Do you feel that the classes you took in college have influenced your style? The design classes definitely influence the way I approach an illustration in terms of the layout and composition. Design is like the framework on which the rest of the image will be built, and a good design will enhance the story. As far as my actual drawing technique and style, I’m mostly self-taught as an illustrator, so that came about from years and years of practice. What were you favorite classes? I liked them all! But in hindsight I’d say freshman foundation year was the most eye-opening. I think it was because everything was new and exciting— the people, the school, the classes– and I was finally in a place where I felt “normal.” Life Drawing classes were especially interesting. It dawned on me that the human body has its own unique kind of beauty in all shapes and sizes when you suspend judgment and just draw. What does a degree in Communication Design train you for? Was WHEN I WAS BUILT published by Henry Holt your first book? What type of work did you do right after you graduated? By the time I graduated I had moved to Connecticut with my future husband. I was hired as an Assistant Art Director at the trade magazine division of Golf Digest and Tennis magazines. It sounds kind of humorous, since I don’t golf or play tennis, but the time spent working in the art department was invaluable to my education in the real world. Besides having an awesome Art Director as my first boss, and great co-workers, I had the chance to hire illustrators for the magazines. This was a great way to learn about pricing, deadlines, and giving creative direction from the other side of the desk. What was the first art related work that you did for money? I began freelancing after my first child was born, as a designer and illustrator, specializing in illustrated maps. So I’d say this was the first real art related work I was paid for apart from an employee’s salary. When did you decide you wanted to illustrate a children’s book? To be honest, it was serendipity! I had begun freelancing, and had an art rep. An editor who loved my maps asked my rep if I was interested in writing stories as well. It seemed like a way to grow creatively, so I gave it a try, and fell in love with the world of children’s books. 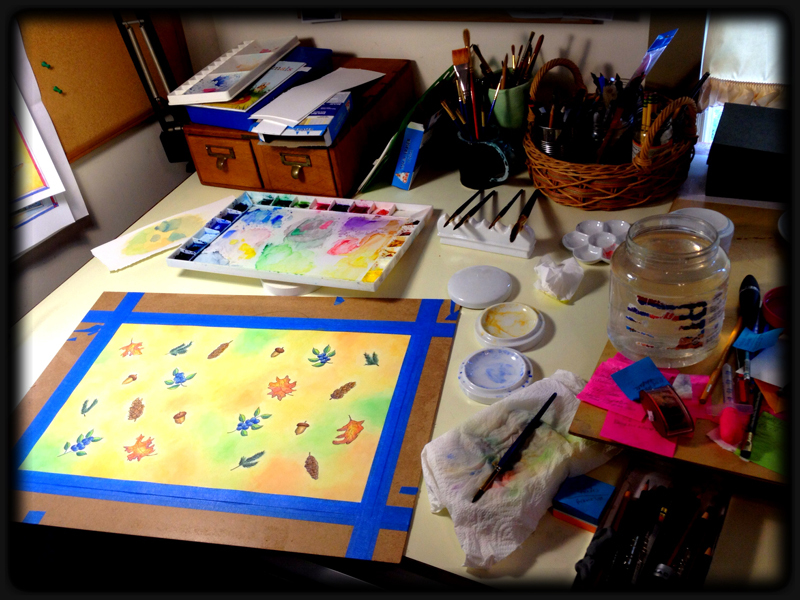 What materials do you use to paint your color illustrations? I use pencil, watercolors, and colored pencil. It looks like early on you wrote and illustrated a few of your own books? Yes, I started out writing and illustrating my own stories. When I Was Built, and Sam Bennett’s New Shoes are the two that have been published. How did that contract come about? I went back and forth over an idea with the editor I mentioned earlier. Though I had always been a huge reader, writing my own story was a BIG learning curve, and the editor was very generous with her suggestions. Though she ultimately passed on that first idea, she loved a second one I had been working on, about an old house and the changes it had seen over the years, and she bought it! Do you consider that book to be your first big success? Sure! But after 20 years of ups and downs in the business I believe anyone who keeps creating art is a success. I see that you illustrated Maggie & Oliver or A Bone of One’s Own with Henry Holt in 2011. Did you your previous work with them help you get that contract? I think it was purely coincidental. Maggie & Oliver came about from a black & white postcard I had given to an editor from Holt at one of my illustrator’s group meetings. She passed it on to another editor, who then looked at my website, and offered me the book. So really, I think it all comes down to your work being right for the particular project. How many picture books have you illustrated? You illustrated The Iciest, Diciest, Scariest Sled Ride Ever! and There’s No Moose on this Island with Islandport Press in 2012 and 2013. Was that a two-book contract? No. I was working on Sled Ride, and after sketches were approved and I was given the go-ahead to start final art they offered me No Moose. It was very gratifying to be offered the second book. How did you connect with them to get those contracts? I keep a mailing list of editors and art directors and send out postcards 3 or 4 times a year, and Islandport was on my list. I had sent them a map postcard, which is somewhat different from my illustration style, and it caught the editor’s eye. She then looked at my website and liked my illustrations enough to offer me the book. I give her a ton of credit for seeing the different possibilities for my work. Do you feel living in New England helped you get the contract with a local publisher? I’m not sure if that made a difference with Islandport. Connecticut and Maine are still pretty far apart, so we don’t work face to face, but I think they do prefer to work with New England based authors and illustrators, because New England is such a part of the identity of their books. You also have a new book, Bear and Bird coming out in March with Sleeping Bear Press. How did that opportunity happen? Again, that came about through the postcards. (I’ve had a LOT of good luck with postcards!) The Art Director who called told me she had been saving the ones I had sent for a long time, just waiting for the right story to come along. It’s nice to know that really happens! Do you think the Internet has opened doors for you? Absolutely! It’s hard to remember how I used to get work in front of editors and art directors before the internet. Plus it’s my freelancer’s water-cooler… a great way to take a break and chat with friends in the field. It’s inspiring to feel connected with others in the creative community, especially since most of us work on our own. Have you done illustrations for any children’s magazines? I did maps for educational publishing magazines way back when I was starting out, including one for Highlights years ago, but not anything on a regular basis. When did you realize you were good at illustrating maps? After I started playing around with designing and drawing the maps my style evolved, and I realized how much I enjoyed doing them. I love looking at maps and imagining what the world is like in different places. (Doesn’t everyone?!) As far as being good at them, I don’t know… I don’t really think about it that much… I just do them! Honestly, it’s still a nice surprise when people say how much they love them. Have most of the maps you’ve done been for educational publishers? Way back when I was with my art rep I did more educational work. Eventually that evolved into maps for travel and regional magazines, and some newspapers. This was my bread & butter work for many years, until it turned off like a spigot when the market crashed in 2008. (Thanks, market.) These days I do more maps for books—usually middle-grade novels– which makes me very happy, since the books have a much longer life. What types of things do you do to find illustration work? I send out postcards a few times a year, and I try to keep my website up to date with new pieces. I also post sketches and works in progress on my blog and various social media. Do you feel that having your illustrations displayed in the SCBWI Bologna 2012 Illustrators Gallery at the Bologna Children’s Book Fair increased your visibility and brought you more attention? I’m sure it did, though I can’t pin anything directly to it at this point. That’s the funny thing about this business— sometimes it takes years for something to come to fruition. You never know who will see your art and where things will lead. That sense of possibility is what keeps me hooked. What is the one thing in your studio that you could not live without? A pencil with a good eraser. Do you try to spend a specific amount of time working on your craft? I’ve been fortunate to be working steadily for the last couple of years, so I’m pretty much constantly thinking about craft at the same time. Also, I always keep a sketchbook nearby to catch those fleeting thoughts and ideas for later. (I call it my “brain.”) I consider that part of keeping up with your craft. How did you connect with Marietta Zacker from Nancy Gallt Literary? I attended the Rutgers One-on-One Plus conference in New Jersey for a number of years (a FANTASTIC conference, by the way, if you ever get a chance to go), and Marietta was on their council. I’d heard great things about her, and queried through the agency’s website. She loved my illustrations and really connected with the story I’d sent her. (One of the many reasons I knew she was the right agent— she “got” my work!) After sending her a few more works-in-progress and talking back and forth over a couple of months, she offered representation. That was a Happy Dance day! Is she comfortable selling just your illustration or does she expect you to be writing and illustrating more of your own books? Marietta handles both, which is perfect, because I love doing both. What do you use with your black and white illustration? I use the same things that I do with the color illustration, pencil, watercolors, and colored pencil, but with black. Do you use Photoshop or Corel Painter with your illustrations? Not for creating, but I use Photoshop to clean up scans if a client requests that the art be delivered digitally. Do you own or have you used a Graphic Drawing Tablet in your illustrating? I actually do own a small tablet and have been meaning to learn how to use it for… too long now! It’s on the never-ending to-do list. Do you have any career dreams that you want to fulfill? Quite simply, I want to keep creating books. I’m happiest when I’m drawing, painting, and writing. I’ve also found that good things happen when I concentrate on those things, and stop worrying about all the other stuff that I can’t control anyway. I’ve just completed black and white illustrations and a cover for a middle-grade biography called Little House in the Big Woods, the Story of Laura Ingalls Wilder. It is with Christy Ottaviano Books, and will becoming out in September. I’m super excited about this book! Now that it’s wrapped up I’m diving in to an idea of my own that I’ve been working out in my head while under deadlines. And it involves maps! Do you have any material type tips you can share with us? Example: Paint or paper that you love – the best place to buy – a new product that you’ve tried – A how to tip, etc. Also, tear off a little piece of a “Mr. Clean Magic Eraser” sponge, dampen it with water, and dab it on areas where you need to make the paint disappear. You can find it in the cleaning section of the grocery store. Magic, indeed! Any words of wisdom on how to become a successful writer or illustrator? Oh, wow… work hard… figure out what’s unique about your art and try to enhance that quality… keep thinking about how to evolve your art… ignore your pesky inner critic… learn from others, but don’t fall into the trap of comparing your work/career to theirs, because everyone’s path is different… compete only with yourself… stick with it… celebrate every little success! Please take a minute to leave Jen a comment. I am sure she would like that and I know I would. Thanks. Thanks, Jennifer and Kathy for a great interview. So interesting. I’m a big fan of Jennifer. I love her work. Congratulations on all the successes! Love, love Jennifer’s work. It has such a warm inviting quality to it. Wonderful interview! Lovel work, and thanks for a great interview. I love your words of wisdom too. Lovely moving images, and I enjoyed reading about Jennifer’s journey! Thanks for this peek into the process! Those watercolours are the kind of charming illustrations I grew up with and it’s beautiful to see such an old-fashioned process (with a few digital upgrades) still working well today. After all that colour, I was stunned by those black-and-whites, as well. They’re magnificent. What a talented artist! Wonderful interview and amazing art work. It has such a wholesomeness to it as well as a timelessness. Thanks for this introduction to Jennifer’s art. I particularly liked the windy fall day illustration. Terrific interview with Jennifer. She has a lovely, timeless quality to her work and I thoroughly enjoyed taking a peek into her history and her process. Opening a box of Mr. Clean magic erasers right now! Wonderful interview! Just discovering Jennifer’s work today, so it was lovely to be able to read about her process here.